Many modern data centers are now being design to the latest ASHRAE TC 9.9 guidelines that allow the use of fresh air cooling for thousands of hours per year. This obviously saves a tremendous amount of operating expense annually. But a large data center requires thousands, if not tens of thousands, of outside air to provide the necessary fresh air cooling...so how does that air get into the building? Aztec has been providing large outside air intake penthouses for data centers in the northwestern US. These penthouses can approach 20 feet in length by 8 feet in width and 8 feet in height...no small structure! 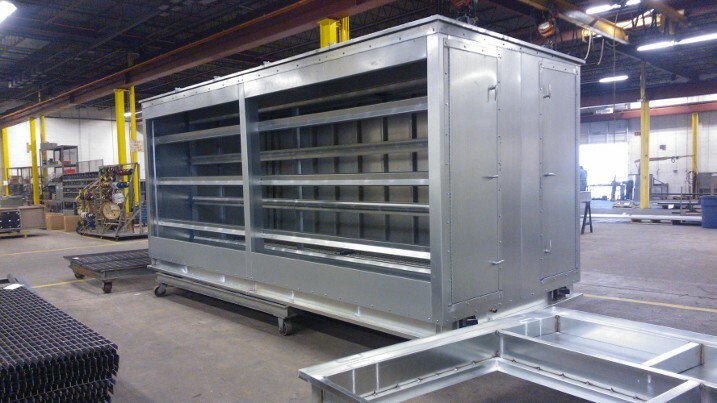 Each penthouse must also be designed to prevent water from entering the data center so the Aztec units are designed with welded drain pans, sloped intake hoods, and carefully selected air intake velocities. As an extra precaution against moisture intrusion the penthouses are also equipped with racks to accept "mist eliminator" type filters in addition to the MERV 8 or 11 standard filters that are installed in the penthouses. As an added safety/security feature the penthouses also include a heavy gauge grate over the opening into the data center. Access doors are provided for filter access and some versions include motorized dampers that can be programmed to respond to the outside air demands of the server farm. Aztec is not the only Mestek company that is involved in providing air intake or exhaust penthouses for data centers. The Arrow United division of Mestek is also providing penthouses of a slightly different design incorporating storm-resistant louvers.